As Google has completely phased out our beloved “Google Keyword Tool” – *shakes fist* – it has left a lot of SEO’s bleeding. The main reason for this disappointment is not because of everyone being solely reliant on a platform that doesn’t really have a large push to turn your keyword research into paid revenue stream for Google (AdWords), although more the general and easy to use interface with the ability to filter down search volumes, large column altering abilities and slimline look and feel. 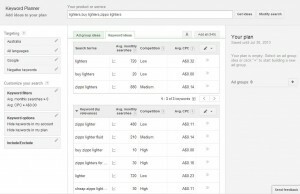 Although – if you are new to keyword research – ignore the above ramble and embrace the new Google Keyword Planner. What does Google have to say about it? 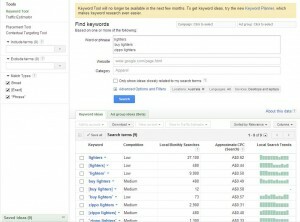 Many people have outlined that they have talked to Google staff, who have either been confused with questions about the removal of prior Keyword Tool functionality or just outlined that they were not aware of it – maybe this is because at time of writing this, they can still refer people to the old Keyword Tool. It is very self explanatory, the new interface is adapting the large white space between data sets to make it easier for the user – same alteration they did with the interface of Gmail over a year ago. The rest of the search sorting / filtration is similar locations, besides the ‘Location’ and ‘Targeting’ options, now being on the left hand columns and the ‘Saved Ideas’ not being in the bottom left corner but is now “Your Plan” and found across on the entire right side. What does the “Average Search Per Month” Column Mean? Ignore all suggestions that say if you press the ‘*pencil* & >>’ button (found to the right of the “Avg. CPC” column heading) and change this from ‘broad match’ to either ‘phrase match’ or ‘exact match’ it will change the search suggestions to the correct figures. As many people who have made this suggestion might not have found out – it does not change anything at all – sorry guys. This functionality is only for when you are bringing keywords into the “Your Plan” section, which means that you are going to start trying to target these keywords within your AdWords Campaign. Conclusion: Looking at the results, the ‘one word’ keyword of “SEO” is correct for Google’s suggestions that the new tool is ‘Exact Match’ – however what we are seeing is a lower search volume for the longer tail keywords of 2 words. Across the search of “SEO + locations”, there is a decrease of around 20% – 30% – this is surprising to say the least – now we do not know if this is due to a new set of data that Google is pulling from or if there was corrections to be made in the old data. Conclusion: As you might be able to see, for the lower search volumes, we have a completely different results again, as we are actually seeing almost an increase for the traffic estimation of around 90% – 100% – which is basically double! This is the same with even very low search results (example shows around search of 12’s and 20’s, etc), which we tested across a few products and services keywords but really again could not find a specific reason as to why this might have happened. The ‘Google Trends’ graphs seem to be fairly similar between the old keyword tool and the new. However, that is based on something that wasn’t perfectly defined in the old tool, where as the newer tool goes into detail with months for the graph and search statistics – which definitely is a plus! 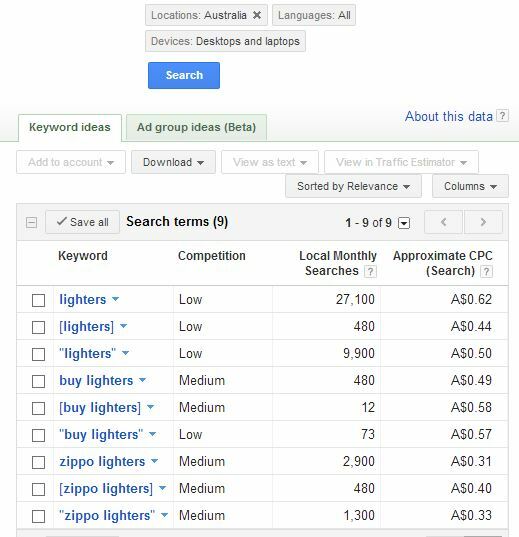 For everyone else who liked to see the local search in comparison to global search, including Ad Shares, non-click required search trends and really customize your result columns – sorry but there is some bad news for you in the new tool – it’s not there. 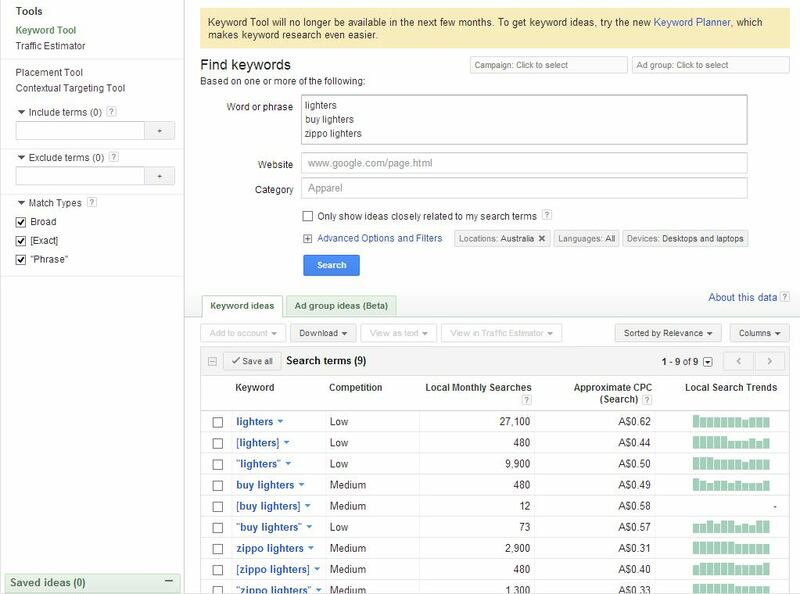 A definite plus in the new tool is the “Keyword Filters” on the left hand side, which allows you to search for keywords based on the amount of search volumes as well as the average cost per click for that keyword. This is really going to help out advertisers who are trying to show clients the benefits of their SEO campaign in comparison to cost of clicks, etc. Selecting specific search patterns becomes harder, as there are no more tick boxes to the left of each keyword. Why is the a negative? One of the quickest content development tactics was to quickly run through the results for a keyword and choose ‘relative’ keywords and download them in a CSV. 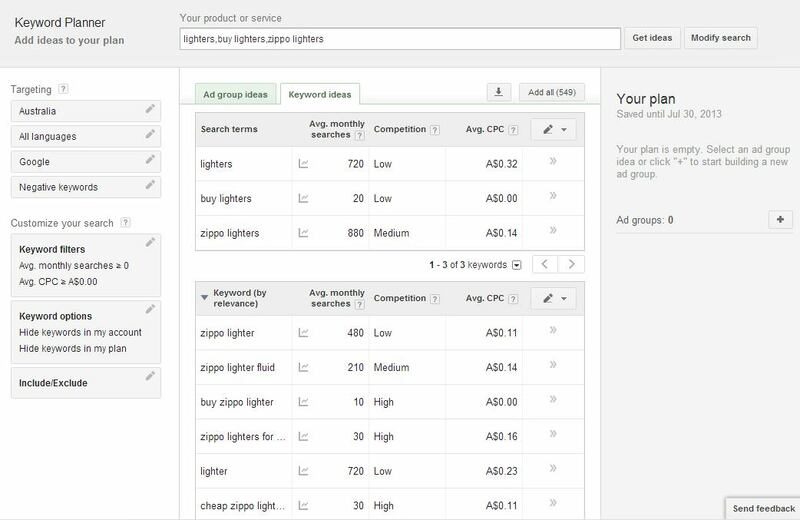 Although we do have the “Ad Group Ideas” tad, which does an okay job at this for you – it does not drill down into unique long tail keywords as the old tactic. A solution to this is to click the “>>” arrows and add them to “Your Place” and just download them. 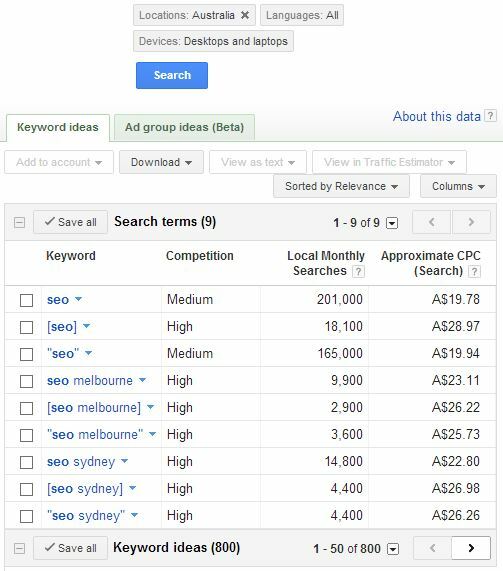 Many, many… many of our newest clients have come from setting up their own AdWords campaigns (although this is an amazing sales point for us), they are wasting thousands of dollars due to not specifying whether their keywords should be ‘broad’, ‘phrase’ or ‘exact’ match. Now that the new Google Keyword Planner tool has removed all abilities for people to see the difference in traffic between ‘broad’, ‘phrase’ and ‘exact’ match keywords it makes the ‘start-up’ users of AdWords have a realistic understanding of what their expected traffic volumes should actually be – as targeting ‘broad keywords’ would have the same click results as the suggested traffic of ‘exact match’. Having worked with hundreds of website and business owners, when discussing traffic volumes in comparison to their ‘novice’ ability to search the old “Google Keyword Tool”, their first question is always – “But, but, but, Google said the traffic should be 17,000 visitors and our first campaign only received 800 visitors, Google must be the devil!! !” – Good-Bye first time AdWords customer. 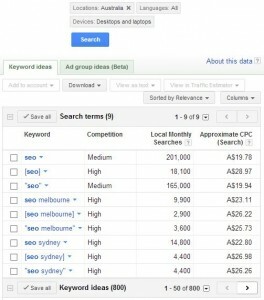 However, NOW the Google AdWords Planner has the possibility to satisfy these people and Google’s Hip-Pocket. As all keyword suggestions are “outlined” to be ‘Exact Match’. Which means that for the first-time AdWords users, they will see an estimation of around 800 for “keyword” and thus, they will add the keyword to their plan and start the campaign….but the ‘default’ import option for keywords (when clicking the “>” button to add the keyword to “Your Plan”) is – SURPRISE – ‘broad match’, where the traffic volumes might just be 5,000. A little unfair to have the traffic estimations is ‘exact’ BUT the hidden import details are defaulted to ‘broad’? Thank you Google, the first-time AdWords user will be satisfied with their traffic volumes, as they probably won’t know how to find out that their clicks were coming through for ‘how can I refill my lighter’, ‘why is your lighter better than mine’ and ‘songs to raise my favorite lighter to’ – all of whom won’t really want to ‘buy lighters’…. sad for the searcher and for the first-time AdWords user, but a quick win for the pocket. As with our limited test base (outlined above and approximately 50 – 60 other searches) there is no pattern as to whether Google has included or excluded data. We have listed a select data set above in examples which is completely inconclusive – however with you doing the same searches, your results will likely find the same outcomes. Google – I would either list to people that they are bringing in their traffic volumes as ‘broad’ match and this can sometimes be 10 times higher than the data provided to them… we are nice people, just give us that little booster and with the results we will be customers for life. Complete addict to anything business and has been an online strategist for over 600+ start-up and established businesses. 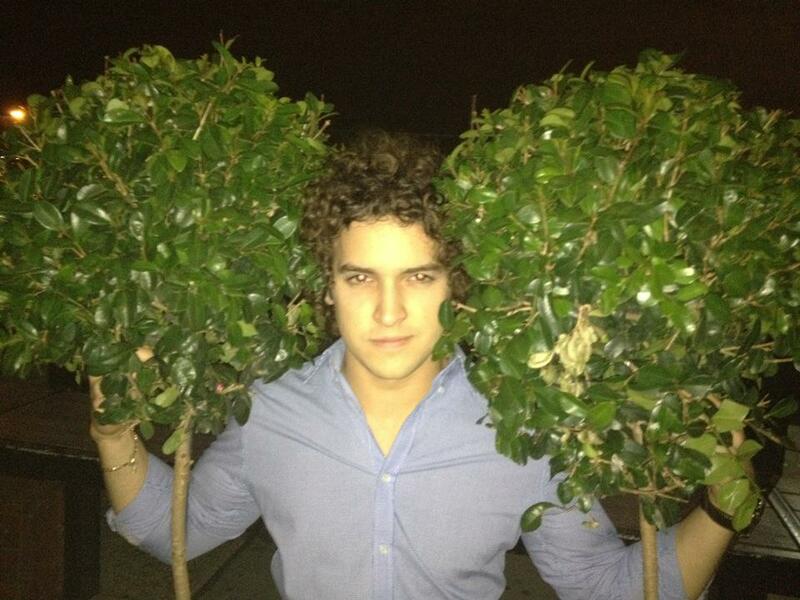 The type of guy who talks at an elderly home, just for the attention.